Our core service is the timely, well priced delivery of quality heating oil and diesel fuel to our family of customers. We offer same day delivery in quantities as small as 25 gallons, seven days a week, year-round. For automatic delivery customers, our sophisticated weather data tracking software and your estimated fuel consumption are collated to tell us when you need oil, providing even greater customer convenience. Whenever you need us, Cochran is there. Whether there’s a power outage due to a storm or accident, these outages leave Delaware area residents in the dark on a regular basis. Are you ready for a power outage? 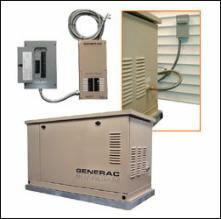 Your family’s lives don’t have to be interrupted and inconvenienced the next time the power goes out. Allow our professional electricians to install a generator to power your home’s critical systems during an outage emergency. Cochran Oil Company serves both residential and commercial customers in northern New Castle County. Our customers include banks, Catholic Social Services, senior centers and healthcare facilities, churches, organizations, charities, and the military providing heating oil, diesel fuel, and off-road diesel as well. Cochran Oil is proud to do its part in being the exclusive supplier to DART of special environmentally friendly, hybrid clean-air diesel fuel. Discount prices may apply to you or your group. Please call or contact Customer Service for specific details.